Rage started out as a corner store 20 years ago, when Marny bought a silver bracelet, for her now husband, with a little man on it. After receiving so many compliments from their friends, they decided to start a small shop selling only silver Jewelry. It later seemed, that this little man was called kokopeli: God of good luck and fertility. 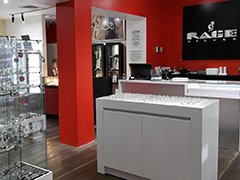 Discover RAGE silver?s extensive selection of Sterling Silver Jewelry, stainless steel and watches. Owner Marny travels the world and handpicks the best designs and highest quality. At Rage you can find jewelry with great price points for yourself, your loved ones and/or friends. Including brands like Buddha to Buddha, Crislu, Chamillia, Tisento and Uno de 50. A friendly staff awaits you to make the perfect choice.